WELCOME TO MY SALES PAGE!!! - STILL ALWAYS ACTIVE, MESSAGE ANYTIME!!! Welcome to my sales page!!! I buy all of my official collectibles directly from Japan (Animate/Movic), so rest assured that these are the real deal!! Please click on the sales tag of your interest and take a look at all the items available!!! There are NO RETURNS and NO REFUNDS, unless I make a mistake, which doesn't happen, so please make sure you're serious about buying before you ask to buy =) I guarantee safe packaging and I send out shipping confirmation, so if your postal service doesn't deliver to you, it's not my fault and I will not be responsible for lost or damaged packages. If you're interested in multiple items, feel free to ask. 3. Check, Money Order, Cash : Send your money at your own risk, I will not ship out items until I have received your payment. 4. PayPal : I'm not forcing you to use this method, if you want to use it, you pay for your own fees. 7. Please feel free to ask questions regarding the price or shipping before purchasing! 8. First come first served. If I can buy more of the items, I will update again, please check back! Hello, thank you for your purchase!!!!! Your feedback for me as a seller is truly appreciated~~~ Please leave one here after your transaction has been completed, thank you very much!!!!! 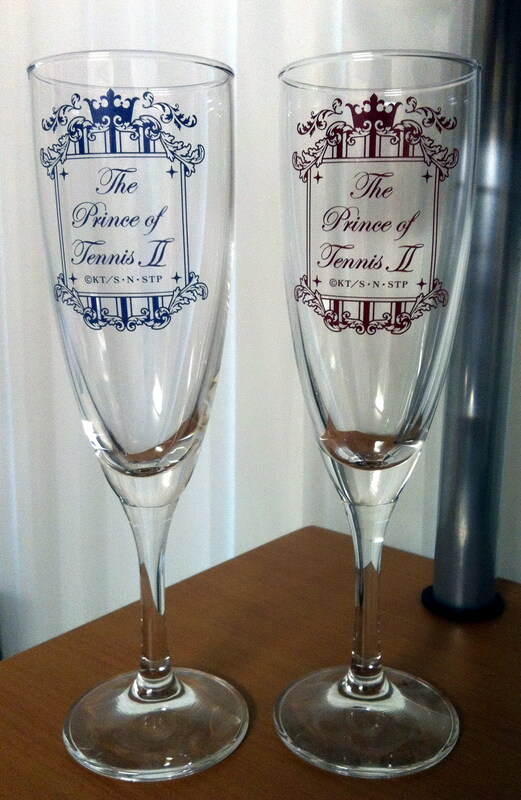 This pair of PoTII Wedding Glasses is so pretty!!! The nth volume of Shinpuri Kutsurogi ~ in Shopping will be released in November! They come in a set of 14, so if I get about 7 characters requested from a set then I will buy a box. Each sticker will be $12, first come first served. I will receive sometime in December. The Bocchi-kun Straps can be purchased individually, $13/strap, so order as many as you like!! ONE BOX OF RELAXATION STICKERS HAS BEEN ORDERED!!! I have also ordered one box of the Mini Clear Files Travel Airmail Series. For those who have not gotten their hands on these, reserve! Each file will be $7. This is a set so there is only one of each. 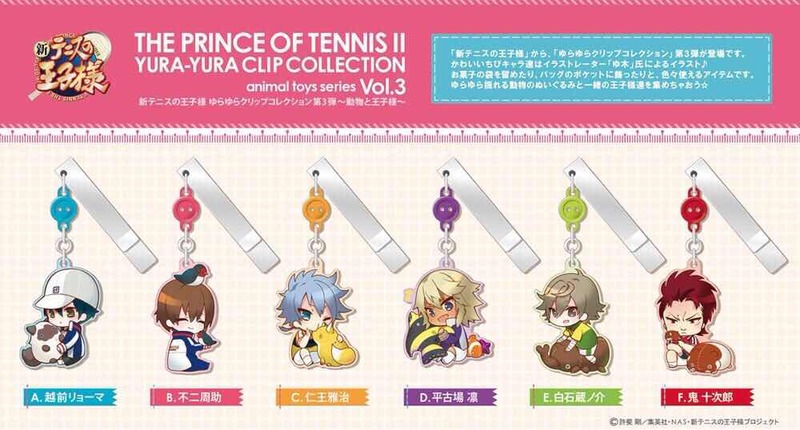 Prince of Tennis YuraYura Clips vol. 3 - Animal Toys Series Preorder! This third series is super cute as were the first two~ In this one, the cutie chibis are holding their favorite animal toys!!! Releasing in September, they will be ready to ship mid-October. Because this is a set, if I get at least four characters reserved then I will buy a box! Each clip is $12, first come first served! KUROKO NO BASUKE 4Q ONE COIN FIGURES AND YURAYURA CLIPS!!! So many new items are coming out for KuroBasu, it's wonderful!!! Next up we have the 4Q One Coins - Junior High version coming out in August, so I would receive in September. (Kagami is super cute in this set LOL, cuz of his casual clothes maybe!!!) This comes in a box of nine, I don't know which characters would be extra, so I can put your names down for multiple, and of course it will be first come first served. They will be $14 each figure, if I get 5 reservations, I will buy a box. The YuraYura Clips volumes 2 and 3 are coming out in June, I would receive them in July. They will be $12 each, if I get 4 reservations for either set, I will buy the set. Again, please be serious when you place a reservation. Please let me know if you are interested!! ONE BOX OF 4Q ONE COINS, ONE BOX OF YURAYURA VOL.2, and TWO BOXES OF YURAYURA VOL.3 HAVE BEEN ORDERED!!! GO AHEAD AND RESERVE AS MANY AS AVAILABLE!! !